Danny Shmuel's handicap caused by a serious motorcycle accident doesn't prevent him from volunteering as an EMT with United Hatzalah. Danny Shmuel was injured in a serious motorcycle accident in 2000. After a long period of rehabilitation, Shmuel was able to walk again with the help of crutches. Yet his handicap does not prevent him from volunteering as an EMT with United Hatzalah and saving lives. Shmuel serves as the chapter head of United Hatzalah for Tel Aviv a city that has seen a groundswell of new volunteers in the past year. In spite of his handicap, Shmuel rushes to every emergency that takes place in his vicinity in order to provide medical assistance for others in their moments of need. However, he has had to struggle with his crutches and it does slow him down occasionally. 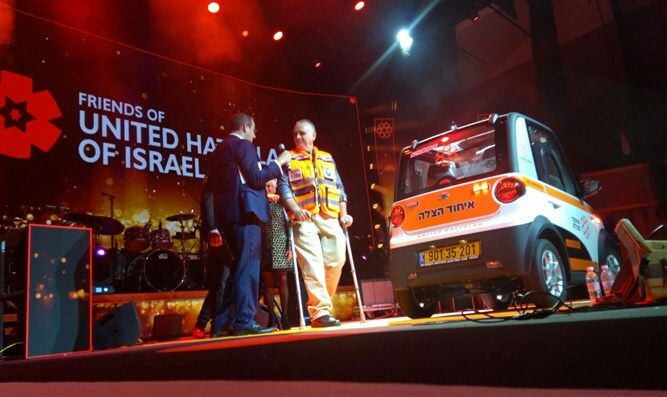 On Monday night, during United Hatzalah’s annual Sukkot concert in Jerusalem, the organization honored Shmuel’s dedication to saving others by presenting him with a new vehicle aimed at helping him arrive at the scene of emergencies faster, the “Mini-lance”. This small mini-ambulance runs on electricity and can reach speeds of up to 80 kilometers per hour and due to its small size, it will be far easier to navigate traffic, park on the crowded streets of Tel Aviv and help Shmuel arrive faster. Beer added that in the near future, the organization will be spreading a fleet of the new vehicles across the country to help facilitate faster response times and cut down on fuel emissions to help protect the environment.